3 Why do a computer science PhD? 6 Who should most strongly consider a computer science PhD? 7 Want to use a CS PhD to make the world a better place? We want to help. A computer science PhD offers the chance to become a leading researcher in a highly important field with potential for transformational research. Especially consider it if you want to enter computer science academia or do high-level research in industry and expect to be among the top 30% of PhD candidates. Most people qualified to do a computer science PhD should seriously consider doing a PhD focussed on Machine Learning, which we cover in another profile. • Potential for large impact from your research. • Opportunity to become an expert in AI. • Freedom to pursue research topics that most interest you. • Less than 10% end up with tenure-track jobs. • Takes a long time (5-7 years), with relatively low pay. • About half of those who enter industry afterwards don't end up with research positions. Strong quantitative skills (i.e. above 650 on quant GRE), want to enter high-level computer science research roles, extremely interested in computer science research. If you are interested, try out doing computer science research by doing a dissertation as an undergraduate or taking up research assistant jobs in a professor’s lab. Then read this advice on how to get in. For this profile, we read eight blogs by computer scientists on whether to do the PhD and reviewed the Taulbee survey (the full list). See all the other research we did in our wiki. In this profile we focus on doing a Computer Science PhD in the US, which usually takes 5-7 years. There is relatively low emphasis on taking classes – typically you only take classes when they are relevant to your research, and these can be in disciplines outside of computer science, including statistics, operations research, maths, psychology and linguistics.1 The PhD is heavily research focused – by the end you write a dissertation which is a long and in depth exploration on a topic that you become an expert on. Employment of new Computer Science PhD’s in US and Canada. 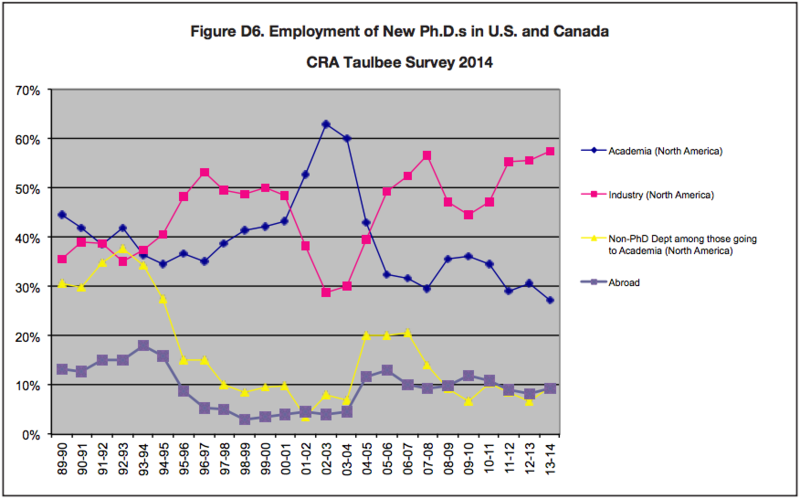 Source CRA Taulbee Survey 2014. Why do a computer science PhD? You become fluent in both written and verbal technical communication: “I’ve noticed a big gap between the software engineers I’ve worked with who have PhDs and those who don’t in this regard. PhD-trained folks tend to give clear, well-organized talks and know how to write up their work and visualize the result of experiments. As a result they can be much more influential.”3 This is a skill that’s important for entering data science. You learn to run experiments and interpret the results and get every aspect of your methodology closely critiqued. You learn how to read and critique research papers. During your PhD you get to work on the hardest problems at the edge of human knowledge, in a field with a strong track record of transformational research, in spite of its short history as an academic discipline. “PhD research is about opening up new avenues of enquiry, and working on problems that the rest of the world hasn’t even articulated yet. If you do it right, you can have tremendous impact.”4 A computer science PhD opens up the potential to carry on with this research in academia or in industry. Artificial Intelligence is one of the most important trends of the next century and is currently the most popular area of specialisation among computer science PhD’s.6 We think it’s especially important that more people work on making sure the development of AI is done safely, and there’s increasing funding available for researchers with this aim, making it a promising area to enter. A computer science PhD opens up jobs focused on AI safety in industry (for example at DeepMind), non-profits such as the Machine Intelligence Research Institute, and academia. If you want to work on this research, see our full review of the area. You often become the leading world expert on the area of your dissertation. Highly intelligent peers, and close mentorship and feedback from some of the smartest people on earth. You don’t get wide exposure to different career areas during this time – you only learn about academic computer science. Who should most strongly consider a computer science PhD? To get a sense of what academic research in computer science is like, try reading published papers (see for example this paper and this paper). Given that only 10% end up with tenure track positions and of those that enter industry immediately after the PhD only 50% end up with research positions, it’s unclear whether the PhD is worth the considerable costs for the bottom 50% or so of candidates. You meet the entry requirements. You’re highly motivated to do computer science research. You expect to be among the top 30% of PhD candidates. You want to go into computer science academia or do high-level research in industry, especially if you want to work on artificial intelligence. Want to use a CS PhD to make the world a better place? We want to help. We’ve coached dozens of people entering a CS PhD, and can often put you in touch with relevant experts for more guidance, particularly in AI/ML.